Okamoto T, Kawakita A, Kato M (2007) Interspecific variation of floral scent composition in Glochidion and its association with host-specific pollinating seed parasite (Epicephala). J. Chem. Ecol. 33: 1065-1081. 岡本朋子 (2012) 花の匂いの捕集方法. 種生物学研究第35号「種間関係の生物学－共生・寄生・捕食の新しい姿」第12章: 317-332. 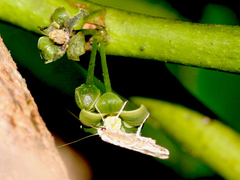 Okamoto T, Kawakita A, Goto R, Svensson GP, Kato M (2013) Active pollination favours sexual dimorphism in floral scent. Proc. Roy. Soc. B 280(1772): 20132280.